Justice A P Randerson graduated from Auckland University with LLB (Honours) in 1972. He joined the legal firm of Wallace McLean Bawden & Partners (later Kensington Swan) and remained with the firm as a senior litigation partner until he commenced practice as a barrister sole. He was appointed a Queen’s Counsel in 1996. Justice Randerson was appointed a Judge of the High Court from October 1997 and has sat from time to time in the Divisional Courts of the Court of Appeal. In September 2009 he was appointed as a Judge of the Court of Appeal with effect from 1 February 2010. Justice Randerson was a founding member of the Resource Management Law Association. Hon Peter Salmon QC commenced practice in 1959 and was appointed a Queen’s Counsel in 1983. In 1992 he was asked to be the RMLAs first President in recognition of his position as the respected leader of the Planning Bar. He was appointed to the High Court in 1996 where he sat until 2005 including in the Court of Appeal. He retired from practice in 2005 but continued to work as an arbitrator, mediator and resource consent commissioner. He was also a Judge on the Pacific Island Court of Appeal and is General Editor of the annotated “Salmon – Resource Management Act” and is joint editor of “Environmental Law in New Zealand”. In 2007 Peter was appointed to chair the Royal Commission into Auckland Governance. One of the ultimate consequences of that review was the promulgation of Auckland’s first unitary plan. Derek Nolan is a Queen’s Counsel from Auckland. Prior to joining the independent Bar, Derek was a partner for 30 years in the environmental and resource management law team at Russell McVeagh. He was one of the founders of the RMLA, served as the second President and was the recipient of RMLA’s ‘Outstanding Person’ award in 2008. Derek is the editor and an author of the award winning LexisNexis text book ‘Environmental and Resource Management Law’, has served as the convener of the Environmental Law Committee of the NZ Law Society and has chaired Continuing Legal Education Intensives in resource management law for the Society. He is also President of The Northern Club and a director or member of several boards. Rebecca Macky is an Independent Hearings Commissioner for Auckland Council. Prior to becoming a full-time Commissioner, she was a resource manageent lawyer first in Queensland (1985-1990) and then in Auckland (1991 – 2016). She has been a Commissioner since 2008. 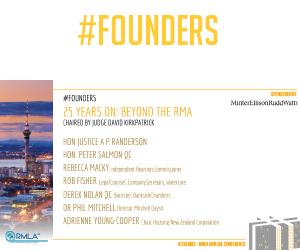 Rebecca co-founded the RMLA in 1992. She served on the National Committee, as President for 2 years and is an honorary life member. In 2001 she was the recipient of an RMLA Outstanding Person Award. In addition to her Commissioner work, Rebecca and her husband conduct military history tours, with Crete being a favourite destination. Dr Phil Mitchell has wide ranging experience in providing strategic environmental advice to both the private and public sectors, and in the implementation of New Zealand’s environmental legislation. Phil is a founding member of the RMLA’s National Committee and a former President of the Association. He is a Full Member of the New Zealand Planning Institute and received that organisation’s Distinguished Service Award in 2015. Phil is an experienced hearings commissioner and hearings chair, and is accredited in both those roles. Phil is the founding director of Mitchell Partnerships Limited, now Mitchell Daysh Limited. Rob Fisher is a barrister specialising in resource management, public law and local government law. He holds responsibility for statutory and environmental planning, resource consents and policy. In a 40-year legal career, he has provided advice and expertise to both private and public bodies, especially in the consenting of large infrastructure projects. Rob was the 2010 Barrister of the Year in the New Zealand Law Awards and was made an Officer of the New Zealand Order of Merit in the 2011 Queen’s Birthday Honours. Adrienne Young-Cooper has a 40-year career in public service, resource management and governance. She is now a full time director and trustee, chairing the board of Housing New Zealand Corporation, and sitting on the boards of HLC, New Zealand Transport Agency, Wairaka Land Company and Cornwall Park Trust Board. Adrienne was a founding member of the Resource Management Law Association.